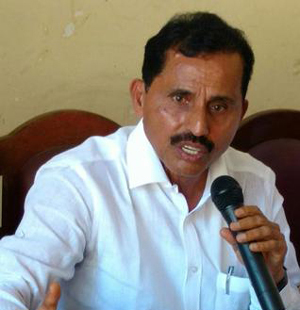 Mangaluru, Dec 11, 2015 : Congress leader Harikrishna Bantwal who has filed his nomination for the MLC election as an independent candidate has made it clear that he will not withdraw his nomination. Speaking to reporters here on December 11, Friday, he said now that he has filed his nomination, there was no question of backtracking. Slamming Rajya Sabha MP and former union minister Oscar Fernandes, Harikrishna Bantwal said it was because of Janardhana Poojary that Oscar became an MP. "It was Poojary who introduced Oscar to late Prime Minister Indira Gandhi," he asserted. "Oscar has no significant achievement to his credit despite serving as Lok Sabha MP for four terms and Rajya Sabha MP for three terms," he added. Making it clear that politics was just his hobby and not a profession, Harikrishna Bantwal said attaining power was not his sole objective. "Had I craved for power, I could have achieved it long back as senior Congress leader B Janardhana Poojary with whom I have an association of nearly 33 years was close to late prime ministers Indira Gandhi and Rajeev Gandhi," he said. Making an indirect reference to the Congress candidate Pratapchandra Shetty, he said the party has granted ticket to a man who had earlier revealed that he was not interested in politics. He also pointed out how party workers had complained to him that Shetty in his capacity as MLC has not attended even a single meeting of MCC and that neither was he visiting panchayats. He has even remained mum in the Legislative Council, Harikrishna Bantwal said and clarified that he was contesting as per the wishes of the part workers. He even questioned the party for not finding any suitable candidate other than Pratapchandra Shetty when it had prominent leaders like A C Bhandary and Kallige Taranath Shetty who are also from the Bunt community. On the incidents that preceded his filing nomination, Harikrishna Bantwal said "Janardhana Poojary who initially asked me not to contest, later after four days assured to speak to Sonia Gandhi. Even Minister Ramanatha Rai asked me to contest and after deliberations with party leaders, he took me to Chief Minister Siddaramaiah who asked me to speak to Oscar. Even KPCC Chief gave a similar suggestion. Mangaluru South MLA also came in support of me and I spoke to all party leaders including State Ministers U T Khader, Vinay Kumar Sorake and MLAs Vasanth Bangera and Pramod Madhwaraj." "I even met Oscar twice and he said I was the best candidate. Ultimately I was not given a ticket," rued Harikrishna Bantwal. He also declared that he was ready to face any consequences arising out of his decision to contest as an independent.